College Scouts Attend Heat Open Gyms! Rockford Heat has had multiple college coaches in their open gyms recently, however tonight’s visit from University of St Francis was “Special”! Tonight Coach Renee Martin-Assistant Coach for St Francis University was in the house. Renee Martin(Class of 2014, North Boone) was part of Rockford Heats first graduating class of Heat Alumnae. Coach Martin now is our first Rockford Heat college graduate to step into the ranks of coaching. John Penney has thisvto say-Coach Martin will always be one of the toughest, hardest working kids I have ever coached. To see Coach Martin back in the gym just brings tears to my eyes, said Wendy Lambrigtsen! Coach Renee Martin, we wish you the best and have no doubt that you will be successful in your next Basketball journey. Heat FRESHMAN Brooklyn Gray Picks Up D1 Offer! Shout out to Rockford Heat Freshman Brooklyn Gray(Auburn High, Class of 2022) for picking up an offer from Chicago State University. This 5’9”, Class of 2022, Point Guard continues to play with college level skills around the rim with a knack for knocking down the 3 ball! Brooklyn lead the charge on a loaded 8th Grade National Heat team this summer that garnered a lot of D1 attention courtside at all the major events in July! Brooklyn will be a player that will only get better, has a strong work ethic that keeps her in the gym! Keep up the hard work Brooklyn! Top Freshman Shows Well At Elite Camp! Nice job to top Freshman Prospect Miyah Brown(Winnebago High) for showing well in the Scout Focus Elite 80 Camp held this past weekend in Deerfield. Miyah continues to show why she is a top prospect in the Midwest and has garnered attention from several top Div 1 Coaches in the country! Miyah has also been identified as a top recruit by 815 Hoops Report at https://815hoopsreport.com/815-hs-girls-2-watch. Great job Miyah and keep up the hard work! Heat 7th Graders Win Tourney! Shout out to the 7th Grade Girls @hoopstars Champions! These ladies won the annual 3 on 3 tourney held downtown by Senator Steve Stadleman! Team members are Kaylee Bankes, Kaylee Harter, Marya Otero, and Alayna Petalber! Great job ladies and great tourney Senator Steve Stadelman! 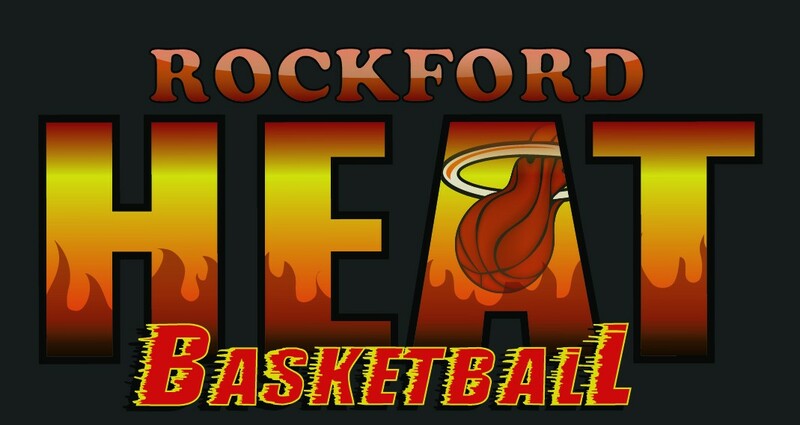 Rockford Heat Winter Rosters POSTED! Due to low turnout for boys tryouts we will only have a boys 4/5 grade along and 2 high school teams this fall/winter. We will plan to have tryouts this Spring for grade levels 3rd-6th on the boys side. 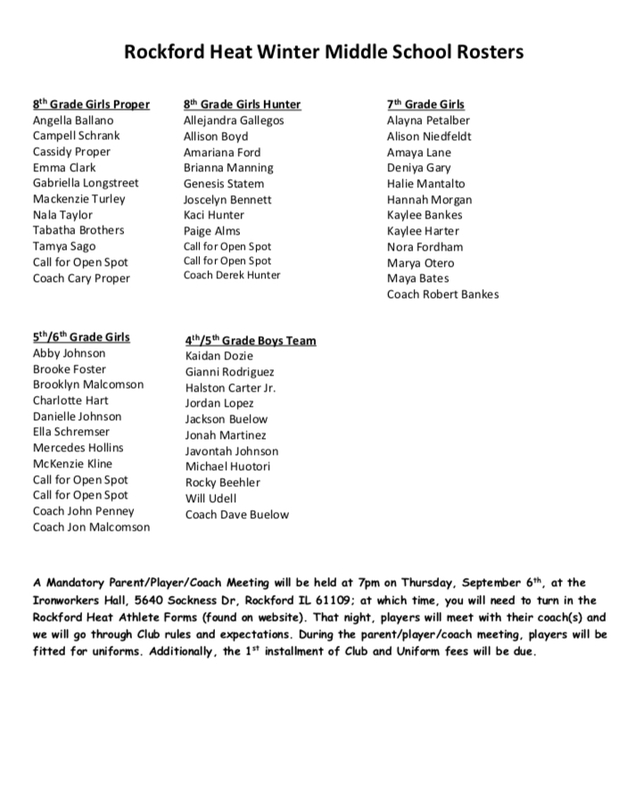 There are a couple openings on the girls rosters, if interested please contact ASAP! If you are unable to accept your spot please contact John Penney.